Scientists used X-rays to discover what creates one butterfly effect: how the microscopic structures on the insect’s wings reflect light to appear as brilliant colors to the eye. Researchers used powerful X-rays to take a molecular look at how the Kaiser-i-Hind butterfly’s wings reflect in brilliant iridescent green. Image: Shutterstock/Butterfly Hunter. The results, published today in Science Advances, could help researchers mimic the effect for reflective coatings, fiber optics or other applications. We’ve long known that butterflies, lizards and opals all use complex structures called photonic crystals to scatter light and create that distinctive iridescent look. But we knew less about the particulars of how these natural structures grow and what they look like at very, very small sizes—and how we might steal their secrets to make our own technology. A powerful X-ray microscope at the Advanced Photon Source, a U.S. Department of Energy Office of Science User Facility, provided just such a view to scientists from the University of California-San Diego, Yale University and the DOE’s Argonne National Laboratory. They took a tiny piece of a wing scale from the vivid green Kaiser-i-Hind butterfly, Teinopalpus imperialis, and ran X-ray studies to study the organization of the photonic crystals in the scale. At sizes far too small to be seen by the human eye, the scales look like a flat patchwork map with sections of lattices, or “domains,” that are highly organized but have slightly different orientations. These occasional irregularities appear as defects where the edges of the domains met each other. “We think this may indicate the defects grow as a result of the chirality —the left or right-handedness—of the chitin molecules from which butterfly wings are formed,” said coauthor Ian McNulty, an X-ray physicist with the Center for Nanoscale Materials at Argonne, also a DOE Office of Science User Facility. These crystal defects had never been seen before, he said. Defects sound as though they’re a problem, but they can be very useful for determining how a material behaves—helping it to scatter more green light, for example, or to concentrate light energy in other useful ways. “It would be interesting to find out whether this is an intentional result of the biological template for these things, and whether we can engineer something similar,” he said. The observations, including that there are two distinct kinds of boundaries between domains, could shed more light on how these structures assemble themselves and how we could mimic such growth to give our own materials new properties, the authors said. The X-ray studies provided a unique look because they are non-destructive—other microscopy techniques often require slicing the sample into paper-thin layers and staining it with dyes for contrast, McNulty said. 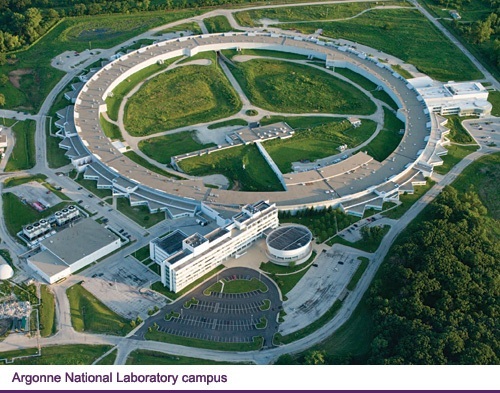 The wing scales were studied at the 2-ID-B beamline at the Advanced Photon Source. The results are published in an article, Domain morphology, boundaries, and topological defects in biophotonic gyroid nanostructures of butterfly wing scales, in Science Advances. Other researchers on the study were Oleg Shpyrko, Leandra Boucheron and Sebastian Dietze (UC-San Diego); David Vine (Argonne/Berkeley National Laboratory); and Katharine Jensen, Eric Dufresne, Richard Prum and Simon Mochrie (Yale). The research was supported by the U.S. Department of Energy Office of Science, Office of Basic Energy Sciences.